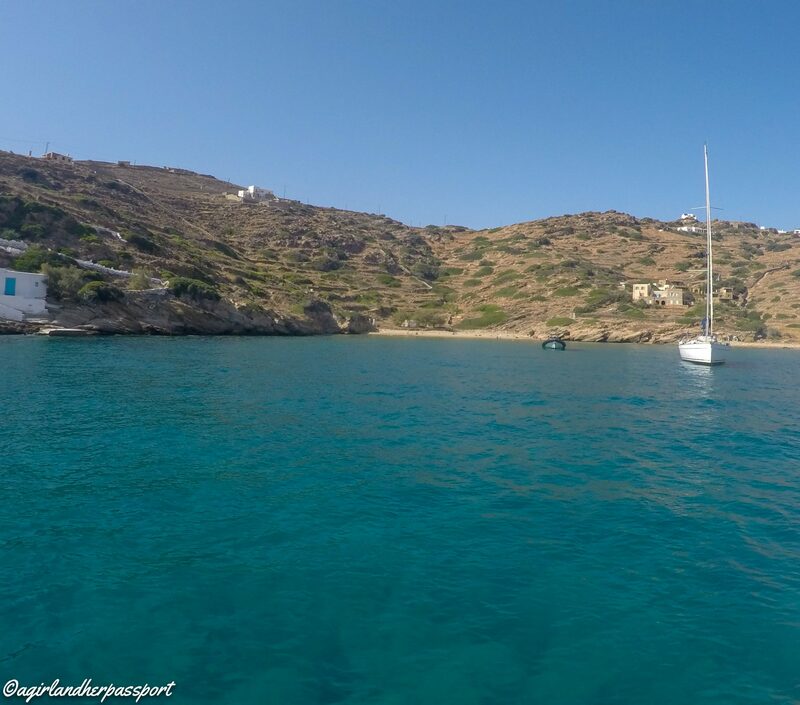 Many people come to Greece to enjoy the fantastic beaches, and the beaches on Ios are not to be missed! 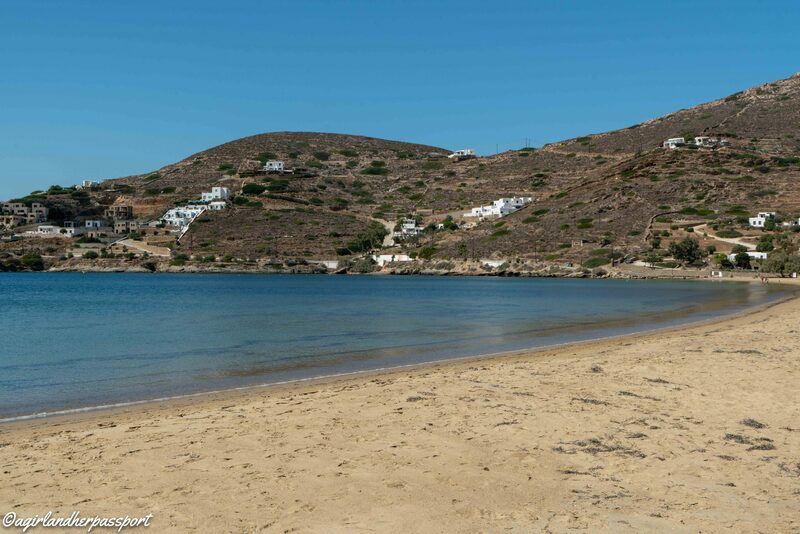 Unlike Naxos beaches, many of the beaches in Ios are remote and so are only accessible by boat or hiking. However, they are worth visiting. 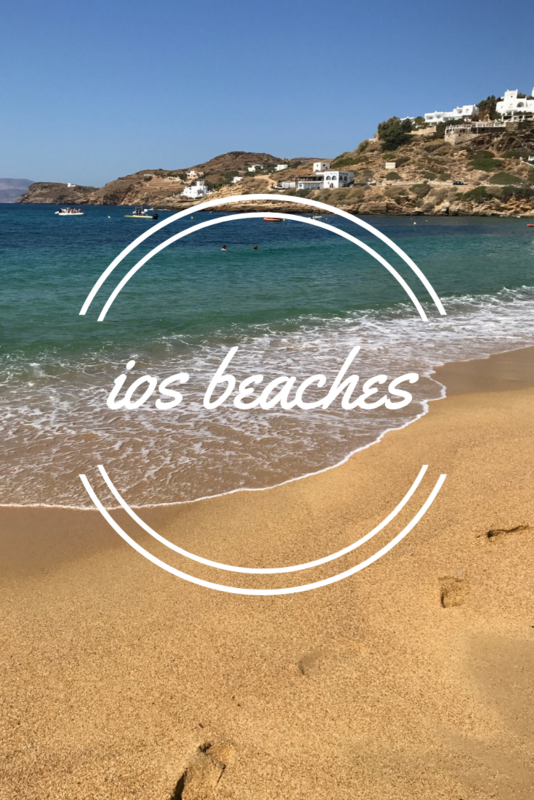 Here are a few of my favorite Ios beaches. Gialos beach is the closest beach to the port of Ios. It isn’t a huge beach but has plenty of space not to feel crowded. The beach is an organized beach, and many places will let you use an umbrella and chairs for free if you make a buy something. There are a few small hotels and pensions to stay at on Gialos beach. 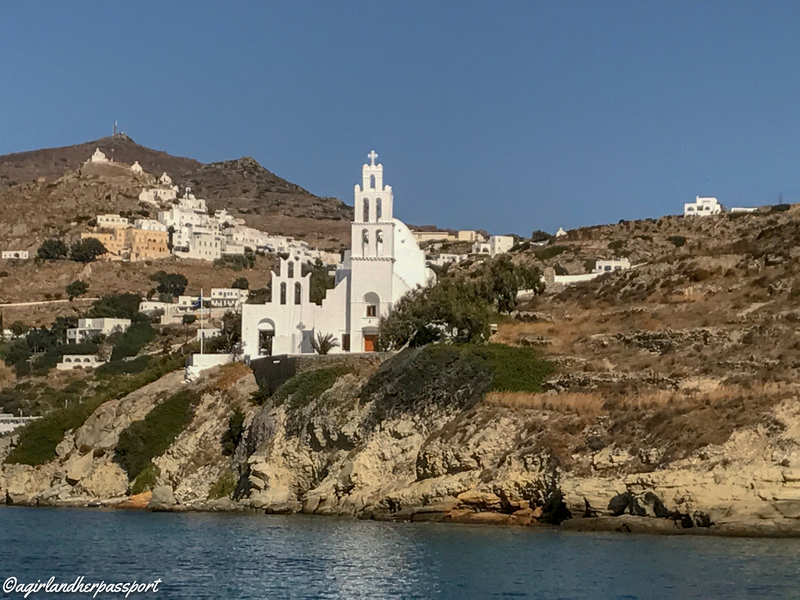 You can walk to the beach from the port in less than five minutes, and if you are in the Chora (village), you can take the bus to the port and walk from there. The water is shallow making it suitable for kids. The only thing to be aware of is that the ferries often arrive in the summer and will cause small waves. 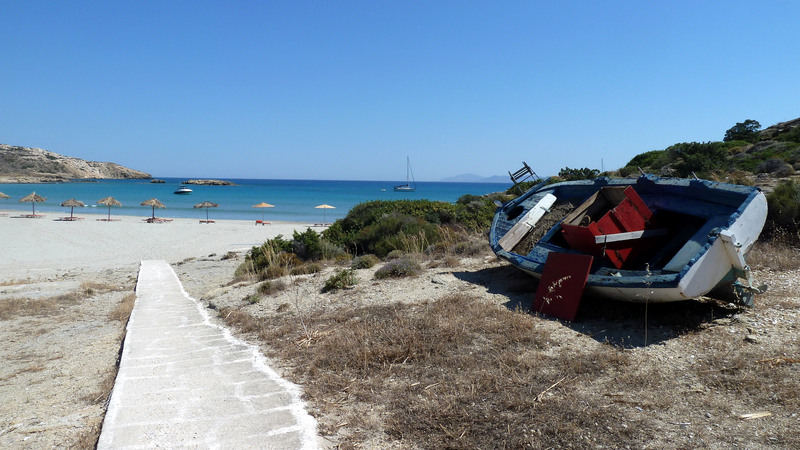 Reachable by bus from the port and village, Mylopotas is one of the most popular beaches on Ios. It can get crowded in the summer. The beach is organized with many options for umbrellas and chairs. You can also go paddleboarding, windsurfing, wakeboard and many other watersports offered by Meltemi Water Sports. The sand at Mylopotas beach is soft golden sand. There are rocks in the water, but the water is deep enough that you can swim over them. The beach is large, so you can choose which section of the beach you want to be on. The choice of accommodation at Mylopotas is large. It ranges from hostels to luxury hotels and apartments. Be aware that the hostel at the further end of the beach has a club outside and is very popular at night. If that isn’t your scene, then you should stay closer to the beginning of the beach. If you are up for a hike to get to a secluded beach, then I recommend going to Valmas beach. 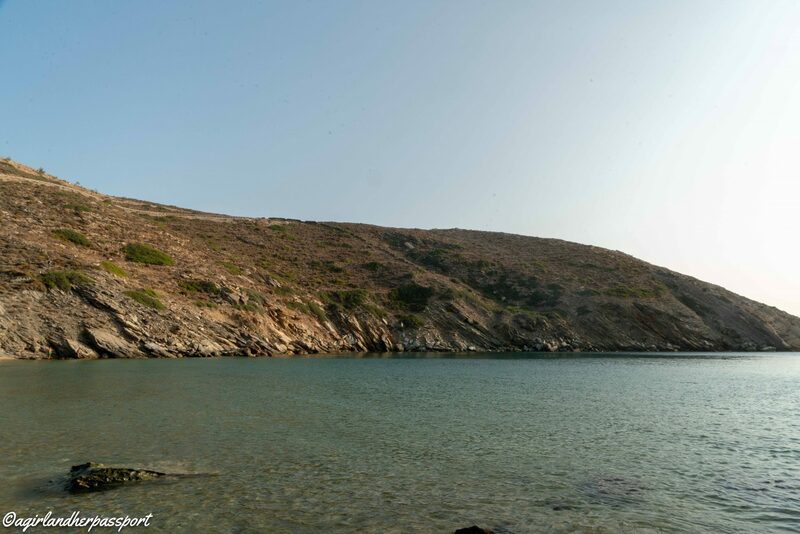 To hike to Valmas beach, you head to the port and walk up to the large church that sits on the hill above the harbor. The path starts before the metal gate to the church on the left. There are several paths once you get past the church and we got on the wrong track a few times, but sometimes the wrong path offered terrific views! Valmas beach is not organized and is small. Go early in the day to get a good spot and possibly some shade. Make sure you bring water and food. The water is deep once you get past the rocks. There is a small cave to swim to as well. If you plan to swim to it, you might need flippers as the waves can be strong here. One of the most beautiful beaches in Ios is Manganari beach. It is remote but is reachable by bus. The online bus schedule doesn’t indicate the schedule, but once you arrive on Ios, there should be a schedule posted at the bus stops. Also, there is a private bus that will take you as well that leaves from the port and the village. There are a few restaurants and hotels here. If you decide to stay at Manganari, you should rent a car as the bus service isn’t frequent. The beach is a large beach with soft golden sand and it less crowded than Mylopotas because of its location. Only some of the beach is organized so you might want to bring a towel to lay on just in case all the sunbeds are taken. The beach is protected from the winds and offers calm water for swimming. This small organized beach is a short bus ride away from the port. While it is small, it offers shallow water for swimming. 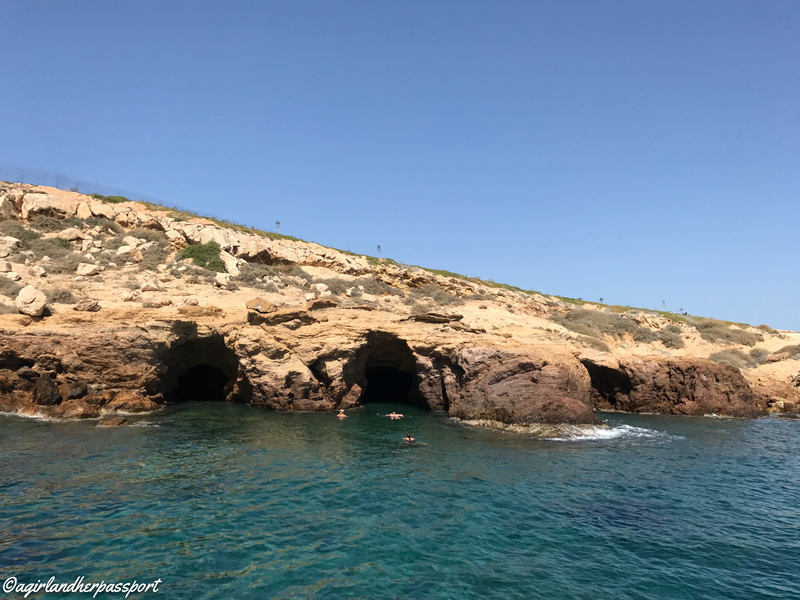 There are also caves nearby to explore via a short swim. Koumbara is a great spot to watch the stunning Ios sunset from. There are a few restaurants and places to stay at Koumbara and is a great quiet alternative to Mylopotas beach. If you are feeling like a walk, you can walk to Koumbara from the port. Follow the road past Gialos beach up the hill and eventually, you will reach it. To reach Loretzena beach, you will need a car as the Ios bus does not go here. The advantage is that is less popular. Given its location, it is not organized, and you will need to bring everything you will need with you. The cove is small and surrounded by rocks. However, the sand is soft, and there is a rock free spot in the middle of the beach to swim from. Loretzena is an excellent place for snorkeling. It is also a great spot to watch the sunset as well. Psathi beach is located on the eastern side of Ios. While it is remote, the bus does go here in summer. There are only a handful of beach umbrellas here. The restaurant in Psathi is not on the beach so you may also want to bring your own snacks and drinks. The sand is golden and very soft. The surrounding landscape is beautiful, and you may never want to leave! If you seek tranquility and peace, there a small hotel here with five rooms. There is a small uninhabited island off the north part of the beach that you can swim to if the water is calm. 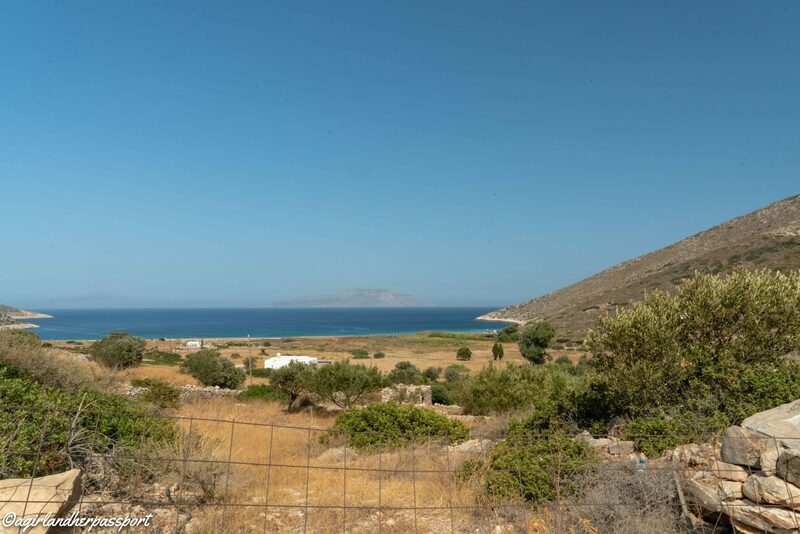 Agia Theodoti is another remote beach in Ios. Agia Theodoti is located on the eastern side of the Ios. You will need a car to get here as the bus does not go here. There are a few hotels and restaurants but not on the beach. The beach is not organized so come prepared. There are some trees to see shade under though. This Ios beach is large and not crowded. The sand is soft, and the water is excellent for swimming. I loved exploring the area behind the beach as well. There are rocks on the northern side if you want to get an amazing view of the whole beach. Kolitsani is a small beach that is not too far from the Ios port. However, it is hard to get to. I arrived here on a boat, but there is a footpath to hike down to it. It is not organized, and sometimes there are nudists on this beach! The water is very clear here and great for swimming. Because of its location, it is less popular and not so crowded. Boats come here occasionally but will not come close to the beach as it is too shallow for them. It is a great beach to escape the crowds of Ios. Are you ready to go to Ios to check out the beaches now? Check out rates for hotels on Ios here. You will need to eat as well, so check out my recommendations for restaurants in Ios. Miserable September night…living vicariously through this post! Sorry your night isn’t good. Glad I could provide an escape! I went to Manganari and it was spectacular. So glad! You went the best way, on a boat!! Skye has been legit stormy the past couple weeks. This post helps. Aww sorry to hear that! I hope it clears soon. Glad this helped!